Somewhere in the range of 3.5 million to 6 million people died as a result of the Napoleonic Wars, which lasted from 1803 to 1815. This includes both military and civilian casualties, and encompasses death from war-related diseases and other causes. Estimates of the number of soldiers killed in battle range from 500,000 to almost 2 million. What happened to all of those bodies? What did Napoleonic battlefield cleanup entail? One of the unusual things about the remains of a soldier unearthed in 2012 at the battlefield of Waterloo (1815) is that the man does not appear to have been robbed. Some scavengers came with pliers. Teeth from dead soldiers were in great demand for the making of dentures. In Spain in 1814, the nephew of English surgeon Astley Cooper received a visit from a tooth hunter sent by his uncle. 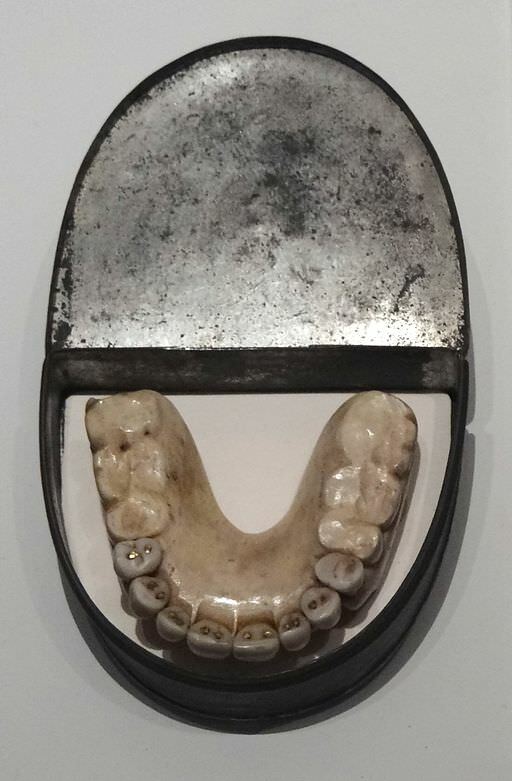 The flood of teeth onto the market after the Battle of Waterloo was so large that dentures made from them were known as “Waterloo teeth.” They were proudly advertised as such, since it meant the teeth came from relatively healthy young men. 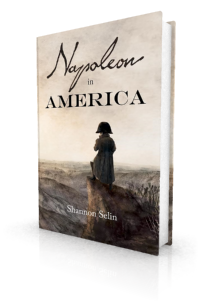 During Napoleon’s Russian campaign, remains lingered for months. 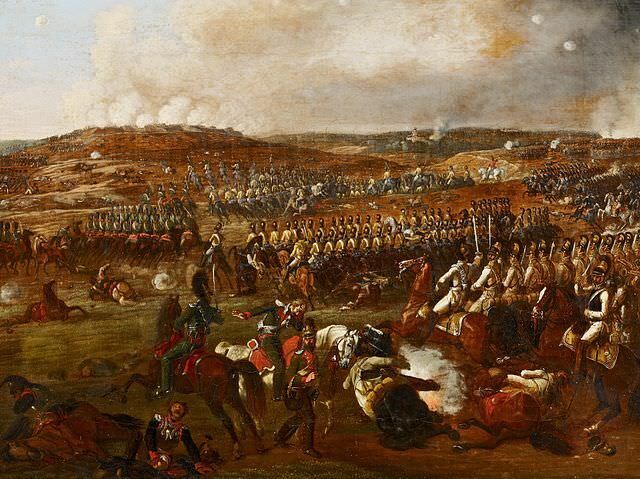 French General Philippe de Ségur described the scene at Borodino (1812) during the retreat from Moscow, almost two months after the battle. After passing the Kologa, we marched on, absorbed in thought, when some of us, raising our eyes, uttered a cry of horror. Each one instantly looked about him, and there lay stretched before us a plain trampled, bare, and devastated, all the trees cut down within a few feet from the surface, and farther off craggy hills, the highest of which appeared misshapen, and bore a striking resemblance to an extinguished volcano. The ground around us was everywhere covered with fragments of helmets and cuirasses, with broken drums, gun-stocks, tatters of uniforms, and standards dyed with blood. Napoleon had ordered the Westphalian VIII Corps to stay and guard the battlefield, transport the wounded to hospitals, and bury the dead while the rest of the army continued on to Moscow. However, the corps could do little for the wounded, as the hospital system was rudimentary and no wagons or other means of transport could be found in the deserted villages. 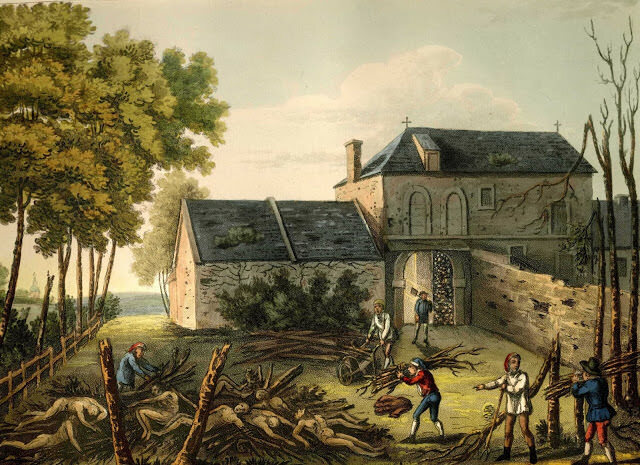 After the Battle of Waterloo, local peasants were hired to clean up the battlefield, supervised by medical staff. The allied dead were buried in pits. The French corpses were burned. Ten days after the battle, a visitor reported seeing the flames at Hougoumont. At Hougoumont I purchased a bullet of grape shot, with which the wood in front of it had been furiously assailed, as was evinced by the marks visible on every tree. The demand for Waterloo relics soon outstripped the supply, though the locals continued for decades to hawk souvenirs that were claimed to be genuine battlefield artefacts. Robert Wilson, Brief Remarks on the Character and Composition of the Russian Army and a Sketch of the Campaigns in Poland in the Years 1806 and 1807 (London, 1810), p. 147. Jean-Baptiste de Marbot, The Memoirs of Baron de Marbot, translated by Arthur John Butler, Vol. 1, (London, 1903), p. 216. Bransby Blake Cooper, The Life of Sir Astley Cooper, Vol. 1 (London, 1843), pp. 401-402. Jean-Roch Coignet, The Note-Books of Captain Coignet, Soldier of the Empire, edited by Jean Fortescue (New York, 1929), p. 81. Jacques Peuchet, Campaigns of the Armies of France, in Prussia, Saxony, and Poland, translated by Samuel MacKay, Vol. 4 (Boston, 1808), p. 201. Achilles Rose, Napoleon’s Campaign in Russia Anno 1812: Medico –Historical (New York, 1913), pp. 32-34. Adrien Bourgogne, Memoirs of Sergeant Bourgogne, 1812-1813, edited by Paul Cottin (New York, 1899), p. 60. Bernard Cornwell, Waterloo: The True Story of Four Days, Three Armies and Three Battles (New York, 2015), p. 325. The New Annual Register, or General Repository of History, Politics, Arts, Sciences and Literature for the Year 1822 (London, 1823), p. 132. Eaton Stannard Barrett, The Talents Run Mad; or, Eighteen Hundred and Sixteen: A Satirical Poem (London, 1816), pp. 18-19. John Scott, Journal of a Tour to Waterloo and Paris, in company with Sir Walter Scott in 1815 (London, 1842), pp. 46-48. Many thanks, Pier. That’s the one. I was working from an earlier article, which said the remains were British. I’ll update the post. Let them see what is on the end of that long newspaper spoon. Were the names of the dead soldiers recorded, so that the parents and widows could be notified? Good question, Hels. I’d like to think that in cases where a regiment was able to identify its dead members, an effort was made to notify the next of kin, and I’ve come across references to Napoleon occasionally dictating such letters, but I don’t know how often this happened in practice. In Scottish Regiments, this was often done through the kirks/parishes, where news about enlisted men, including their deaths, was often nailed to the church door or a nearby bulletin board. In Scotland this was possible because the Regiments often were close-knit societies, with many men from villages enlisting in a single Regiment together. On reading a number of Flemish/northern French soldiers’ letters (http://janvanbakel.nl/menu6.htm), it becomes clear that quite often soldiers, when writing home, also conveyed news about soldiers they knew from their home towns, and so often would ask their own family members to let family X or Y know that soldier X or Y had died, or was in hospital. Thanks, Bas. That’s good to know. Wherever possible it was written down how the soldiers died. Of course it was not very detailed and of course medical knowledge then was not as advanced as today. If we research the records of those fallen we will see the following causes of death: fever, wounds, dysentry and just ‘died on such date’ which is usually the date of or just after a battle. When I look into my own personal records, I have a young forefather of 19 serving in the infantry who died of ‘fever’ in Toulouse in March 1814. Probably was sent to Spanish front for a year but did not survive too long…poor fellow. Another one was serving in the infantry of the Guard in 1813 and together with a friend was allowed to go on leave after the battle of Bautzen in May. When hostilities resumed in August 1813, the young lads were not back yet, so they were given up as ‘deserted’. Their families were arrested instead which prompted the young lads to return to their regiment by the end of August. Hard times! Hard times, indeed! Those poor men and their families. Thank you, Jason. I’m glad there are some records (however imperfect) of how the soldiers died, which could presumably reach their loved ones. Thanks for these excellent links, Tim. Thanks, David. Re. Wagram, James Arnold, in Napoleon Conquers Austria (1995), writes, “under the July heat, the battlefield quickly became a stinking abattoir. Whereas the dead soldiers could be buried relatively quickly, the bloated bodies of the thousands of dead horses…soon putrefied.” (p. 172). Many Wagram bodies were burned near Markgrafneusiedl and the bones are now interred in the church crypt. I think the ossuary at Marengo dates from 1805 and there has been some research on some of the bones. Many of the bodies from Aspern finished up in the Danube and reappeared when the river level fell. What a horrid reminder that must have been for the locals. Thanks for the tip about the ossuary at Marengo, David. I’ve just searched and found this article, which gives details of the research: https://www.researchgate.net/publication/258340883_Bone_lesions_from_the_ossuary_of_the_Napoleonic_battle_of_Marengo_Northern_Italy_14th_June_1800. I was reading this in the British Library recently – three injuries were identified: one was cut in the rear shoulder by a sabrebriquet, one was sabrebriquet or light sabre slashing wound to the skull and the last was a canister round into the pelvis. They all apparently caused “instant death” – it struck me that all three were probably from the final phase of the battle. A very good article, just as shocking as the 24 hours at Waterloo by Robert Kershaw, stripped from all the glory and heroics, which gave me another look at the battles fought in those days. Really interesting article Shannon. This is actually the topic I’m researching for my PhD, except I’m looking at a slightly earlier period (15th-17th century England). Have you found that most references to the disposal of the dead are in memoirs and other personal accounts or other types of source too? That sounds like a fascinating topic, Sarah. So far the references I’ve come across are mainly in personal accounts, but there must be some references in things like financial records, military orders, etc. I just haven’t looked for them. I’m glad to see this. People seldom realize that these wars did not produce cemeteries or even great memorials, which came later. We have an entirely different take now, and glorify war as never before. I was shocked when visiting Westminster Abbey, the war applause that exists there in statues of generals and heroes applauded in marble, along with images of their swords and regalia. Meanwhile, Hastings and Clechy are just a grassy field of ‘hallowed ground’, which really means blood soaked. Thanks, Mary. There was a fair amount of glorification of war at the time (e.g., Napoleon commissioned the Arc de Triomphe in 1806), but people saw more of the gruesome effects than we do today (at least in the West), as war has become more technologized. Thénardier encounters Colonel Pontmercy (the father of Marius) at Waterloo while scavenging after the battle. That’s right! Thanks, Michael. It’s so long since I’ve read Les Misérables, I’d completely forgotten that. I am very much reluctant to believe that there is any truth with regards to Waterloo in 1815, that bones were in later years unearthed to be used as fertilizer. This seems to be a perpetuated myth. Also, there is no overall evidence for Waterloo that much of the bodies were burned, instead of being interred in mass graves. This article by Joe Turner delves into the question of whether battlefield bones were used for fertilizer and concludes that it is probably not a myth: https://medium.com/study-of-history/the-bones-of-waterloo-a3beb35254a3#.aojt9ep4g. As you say, the majority of bodies were most likely buried, and the archaeological research underway at Waterloo (as per Tim’s excellent links above) should provide more information on this topic. Fascinating that the veterans should say that, Andrew. What a telling anecdote, and an excellent quote. Thank you. Here’s a link to the full poem, for those who are interested: https://www.gutenberg.org/files/49658/49658-8.txt. I think you are doing a great job here. The other side of the glorious medal… thank you. Thanks, Shannon, for your presentation. It’s very well done with a wide perspective. I knew only about Wagram and Borodino after-battle depiction. Thanks, Ermanno. I’m glad you found it interesting. A very detailed and fascinating overview of a part of warfare that is often totally ignored. It was General Robert E. Lee who said, ‘It is well that War is so terrible–otherwise we would grow too fond of it.” I come from a family that has borne arms professionally for 700 years, all the way back to the days of armour & swords–and ending with F-14 US fighter planes, machine guns, & B-52 bombers. Thanks for this very appropriate quote, Alphonse-Louis. Sounds like your family truly knows the meaning of it. …a very normal, decent, useful and pretty “human” job. Outstanding article on a subject that is rarely given prominence. It has crossed my mind on many occasions when watching battlefield scenes in films and on tv – who cleans up the mess afterwards? This has inspired me to do some further reading now. Very sharp looking site, impressed and relate with the ‘about’ info. Looking forward to reading your Nap in America book as well. Thanks, Lane. Glad you like the site. 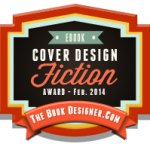 I hope you enjoy the novel. Thanks, Mary. Glad you’re enjoying it! If one were to watch the movie “Colonel Chabert” https://www.youtube.com/watch?v=O8kU6FhOBBY there’s a great little scene after the battle that shows all of the nuances of battlefield cleanup. In “Waterloo” there’s an after battle scene as well where the soldiers are shooting at the civilian looters in order to scare them off from the scene. A much needed post on a question everyone was too afraid to ask. This was fascinating. It is a good thing to see this aspect of battle dealt with. It makes the history more real and more immediate. Life is never a sanitized Hollywood movie. Thanks, Joe. I’m glad you found it interesting. The scene of the most serious fighting at Waterloo was significantly changed by the creation of the Lion mound. Subsequent farming techniques may have further changed the contours significantly removing buried remains as a consequence. Can you recommend any sources of paintings/sketches that give a good sense of the field as it appeared at the time – that can be compared with the field today? Thanks for this good question, Ian. This map of the Waterloo battlefield is said to be the first official sketch of the field (click on the image a couple of times to see the high-res version): http://www.martyndowner.com/sale-highlights/first-official-sketch-of-the-field-of-the-battle-of-waterloo/. And these paintings are said to be the earliest images of the battlefield: http://www.dailymail.co.uk/news/article-2945849/A-damn-close-run-thing-200-years-Waterloo-looked-like-just-days-battle-Wellington-beat-Napoleon.html. One of them depicts the naked bodies of fallen soldiers. Thanks – the watercolours are fascinating. I can’t position any of the views positively on a first view – perhaps more on site research required I think. I have some Mudford prints from 1817. I am sure the artist had been to the battle field although it is not clear when. One of them seems to show individual burial mounds around La Haye Sainte. Excellent find, Ian. The artist was James Rouse and, according to an advertisement for Mudford’s book in The Quarterly Review of April 1, 1816, the engravings were made from “drawings taken on the spot.” Readers who are interested can view the prints online in the McGill University Napoleon Collection. Wrexham County Bureau Council’s Waterloo Archive also has a number of Waterloo prints dated 1815-1817, compiled by Michael Crumplin. Here is how they dealt with the dead. I always wondered about the removal of the dead soldiers and their horses. Now I know. What a terrible end for all of these brave soldiers not to have a proper burial and to end up in farmers’ fields mixed in manure. I am not a soldier, but I salute all of these brave men of all regiments. Thanks for this very apt Shakespearean quote, Dav. We saw the battlefield covered with Austrian and French soldiers who were picking up the dead and placing them in piles and dragging them along with their musket straps. Men and horses were laid pell-mell in the same heap, and set on fire in order to preserve us from pestilence.